The following figure is a modification of an answer to Sketching free-hand, importing into TikZ. The labels $K$ and $U_y$ in the picture designate respectively: the blue-filled region that has a thick solid boundary; and the upper-right-most region, with a dashed boundary, that is partly orange-filled but overlaps region K. Each of these labels is obscured by portions of the boundaries: label $K$ by the dashed lower part of the boundary of $U_y$; and label $U_y$ by the solid boundary of region K.
Question: How can I break those two boundaries so as to allow the labels to be more readily seen? 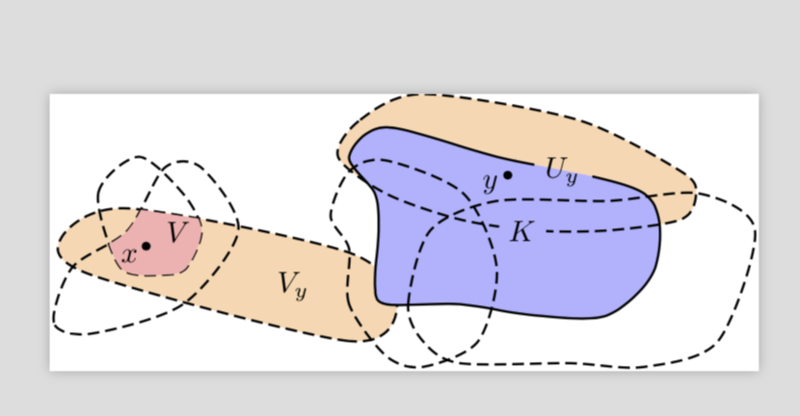 More specifically, is there some nice way to avoid lots of trial-and-error in locating suitable points along the boundaries at which to stop and restart the bounding curves? UPDATE: Something that works for all paths, regardless of whether or not they are dashed: use the reverse clip method. Draw the text node first, and then reverse clip a small region around it and then draw all the contours that you want to have a gap afterwards. OLD ANSWER: Here is a simpleminded method that works for the solid boundary. Tune the lengths of a dash pattern such that there is a gap at the right place. Of course, you can make that more elegant by placing the text with decorations.markings such that it is right in the middle of the gap. Yet for the dashed lines I recommend the method of my previous answer. (If you don't like that method, there is no need to load pgfplots nor its library fillbetween.) EDIT: I was wrong, you do need the fillbetween stuff for the region containing x. I also implemented Derek's nice comment but will be happy to remove it. Improve or simplify this TikZ code for southern hemisphere?